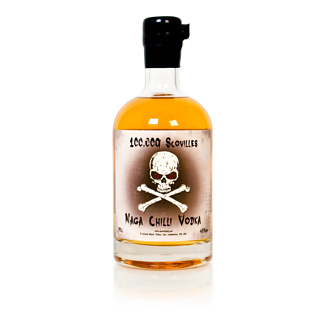 Coming in at 100,000 on the Scoville scale this vodka will definately warm the cockles and is sure to have you singing ring of fire. As you may or may not be aware the heat of chilli pepper is rated using the Scoville scale and this Vodka is up there with the likes of the Habenero and Scotch Bonnet chilli varieties. Caution is advised when downing this tipple!. Definately one for a lads night you may also like the “Bite the Bullett” chocolate challenge. Consisiting of 12 chocolate bullets, players take turns biting a bullet russian roulette style where one unlucky soul will find themselves eating a hot chilli one. Aaaaargh!